Dakosaurus is an extinct genus within the family Metriorhynchidae that lived during the Late Jurassic and Early Cretaceous. It was large, with teeth that were serrated and compressed lateromedially (flattened from side to side). The genus was established by Friedrich August von Quenstedt in 1856 for an isolated tooth named Geosaurus maximus by Plieninger. Dakosaurus was a carnivore that spent much, if not all, its life out at sea. 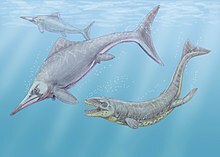 The extent of its adaptation to a marine lifestyle means that it is most likely that it mated at sea, but since no eggs or nests have been discovered that have been referred to Dakosaurus, whether it gave birth to live young at sea like dolphins and ichthyosaurs or came ashore like turtles is not known. The name Dakosaurus means "biter lizard", and is derived from the Greek dakos ("biter") and σαῦρος -sauros ("lizard"). When isolated Dakosaurus teeth were first discovered in Germany, they were mistaken for belonging to the theropod dinosaur Megalosaurus. In 1856 von Quenstedt made Plieninger's Geosaurus maximus teeth a new genus with the name Dakosaurus. He explained the etymology as Greek dakos "Biss" [bite] in 1858 in German, adding "denn wenige kommen seinem furchtbaren Gebiss gleich” [for few can match its terrible set of teeth]. He gave the meaning of Greek dakos more correctly as "Beisser" [biter] in another description in 1859 in which he classified Dakosaurus as a dinosaur. Fossil specimens referrable to Dakosaurus are known from Late Jurassic deposits from England, France, Switzerland, Germany, Poland, Russia, Argentina, and Mexico. Teeth referrable to Dakosaurus are known from Europe from the Oxfordian. The type species Dakosaurus maximus, meaning "greatest biter lizard", is known from fossil discoveries in Western Europe (England, France, Switzerland and Germany) of the Late Jurassic (Late Kimmeridgian-Early Tithonian). Dakosaurus andiniensis, meaning "biter lizard from the Andes", was first discovered in 1987 in the Neuquén Basin, a very rich fossil bed in the Vaca Muerta, Argentina. However, it was not until 1996 that the binomen Dakosaurus andiniensis was erected. Two recently[when?] discovered skulls have indicated that D. andiniensis is unique among the metriorhynchids (the family of stem-crocodilians most specialised for marine life) with its short, tall snout, which lent it the popular nickname "Godzilla" in press reports about its description. This species has a fossil range from the late Jurassic to early Cretaceous (Late Tithonian-Early Berriasian). Dakosaurus nicaeensis, named in 1913 by Ambayrac, was mistakenly classified as a megalosaurid dinosaur; now it is assigned as the sole species in the genus Aggiosaurus. Buffetaut  in 1982 demonstrated that it was in fact a metriorhynchid, closely related to, if not a member of Dakosaurus. As the type specimen is poorly preserved it is considered nomen dubium. In 2009, Young and Andrade published a re-description of Geosaurus, examining its relationships and the validity of species lumped into the genus. Incomplete skull specimens of Dakosaurus have been discovered in Kimmeridgian age rocks from Mexico. D. maximus specimen SMNS 82043. D. andiniensis specimen MOZ 6146P. Dacosaurus is a misspelling of Dakosaurus, and thus a synonym. Dakosaurus–when it contained the species D. andiniensis, D. maximus, and D. manselii–had long been considered paraphyletic, that is, not consisting of a common ancestor and its descendants, until a 2012 study moved D. manselii to the formerly invalid genus Plesiosuchus. All currently known species would have been approximately 4 to 5 metres in length, which when compared to living crocodilians, Dakosaurus can be considered large-sized. Its body was streamlined for greater hydrodynamic efficiency, which along with its finned tail made it a more efficient swimmer than modern crocodilian species. The incomplete skull specimens from the Mexican species of Dakosaurus preserves the chamber in which the well-developed salt glands (known from Geosaurus and Metriorhynchus) would have been housed. Unfortunately, there was no preservational evidence of the glands themselves. Dakosaurus maximus is one of several species of metriorhynchids known from the Mörnsheim Formation (Solnhofen limestone, early Tithonian) of Bavaria, Germany. Alongside three other metriorhynchid species, it has been hypothesised that niche partitioning enabled several species of crocodyliforms to co-exist. Dakosaurus and Geosaurus giganteus would have been top predators of this Formation, both of which were large, short-snouted species with serrated teeth. The remaining two species (Cricosaurus suevicus and Rhacheosaurus gracilis) and the teleosaurid Steneosaurus would have fed mostly on fish. From the slightly older Nusplingen Plattenkalk (late Kimmeridgian) of southern Germany, both D. maximus and C. suevicus are contemporaneous. As with Solnhofen, Dakosaurus was the top predator, while C. suevicus was a fish-eater. Dakosaurus was the only marine crocodyliform to have evolved teeth both lateromedially compressed and serrated; not only that, but they were much larger than those of metriorhynchid genera. These characteristics, along with their morphology falling into the 'Cut' guild of Massare (1987) - which are analogous to modern killer whale teeth - are indicative of Dakosaurus being an apex predator. The enlarged supratemporal fenestrae of Dakosaurus skulls would have anchored large adductor muscles (jaw closing), ensuring a powerful bite. As their skulls are triangular in shape, with deeply rooted large, serrated teeth and a bulbous, deep mandibular symphysis (like pliosaurs), dakosaurs would also have been able to twist feed (tear chunks of flesh off potential prey). ^ Quenstedt FA. 1856. Sonst und Jetzt: Populäre Vortäge über Geologie. Tübingen: Laupp, 131. ^ Plieninger T. 1846. Prof. Dr. Th. Plieninger hielt nachstehenden vortrag über ein neues Sauriergenus und die Einreihung der Saurier mit flachen, schneidenden Zähnen in eine Familie. Pp. 148-154 in: Zweite Generalversammlung am 1. Mai 1846 zu Tübingen. Württembergische naturwissenschaftliche Jahreshefte 2: 129-183. ^ a b c Vignaud P, Gasparini ZB. 1996. New Dakosaurus (Crocodylomorpha, Thalattosuchia) from the Upper Jurassic of Argentina. Comptes Rendus de l'Académie des Sciences, Paris, 2 322: 245-250. ^ Quenstedt FA. 1843. Das Flötzgebirge Württembergs: mit besonderer rücksicht auf den Jura. Tübingen: Laupp, 493. ^ Quenstedt FA. 1859. Handbuch der Petrefaktenkunde. Tübingen: Laupp, 1239 pp. ^ a b Steel R. 1973. Crocodylia. Handbuch der Paläoherpetologie, Teil 16. Stuttgart: Gustav Fischer Verlag,116 pp. ^ Radwańska U, Radwański A. 2003. The Jurassic crinoid genus Cyclocrinus D’Orbigny, 1850: still an enigma. Acta Geologica Polonica 53 (2003),(4): 301-320. ^ a b c Buchy M-C, Stinnesbeck W, Frey E, Gonzalez AHG. 2007. First occurrence of the genus Dakosaurus (Crocodyliformes, Thalattosuchia) in the Late Jurassic of Mexico. Bulletin de la Société Géologique de France 178 (5): 391-397. ^ BM(NH), Trustees of the. 1983. British Mesozoic Fossils, sixth edition. London: Butler & Tanner Ltd., 209 pp. ^ Benton MJ, Spencer PS. 1995. Fossil Reptiles of Great Britain. London: Chapman and Hall, 386 pp. ^ a b Fraas E. 1902. Die Meer-Krocodilier (Thalattosuchia) des oberen Jura unter specieller Berücksichtigung von Dacosaurus und Geosaurus. Paleontographica 49: 1-72. ^ a b Gasparini Z, Pol D, Spalletti LA. 2006. An unusual marine crocodyliform from the Jurassic-Cretaceous boundary of Patagonia. Science 311: 70-73. ^ Young, Mark T., and Marco Brandalise de Andrade, 2009. "What is Geosaurus? Redescription of Geosaurus giganteus (Thalattosuchia: Metriorhynchidae) from the Upper Jurassic of Bayern, Germany." Zoological Journal of the Linnean Society, 157: 551-585. ^ Buchy M-C. 2008. New occurrence of the genus Dakosaurus (Reptilia, Thalattosuchia) in the Upper Jurassic of north-eastern Mexico with comments upon skull architecture of Dakosaurus and Geosaurus. Neues Jahrbuch für Geologie und Paläontologie, Abhandlungen 249 (1): 1-8. ^ Sauvage HE. 1873. Notes sur les reptiles, fossiles. Bulletin de la Société Géologiques de France, série 3: 365-384. ^ Young MT. 2007. The evolution and interrelationships of Metriorhynchidae (Crocodyliformes, Thalattosuchia). 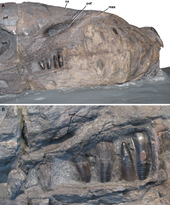 Journal of Vertebrate Paleontology 27 (3): 170A. ^ Wilkinson LE, Young MT, Benton MJ. 2008. A new metriorhynchid crocodilian (Mesoeucrocodylia: Thalattosuchia) from the Kimmeridgian (Upper Jurassic) of Wiltshire, UK. Palaeontology 51 (6): 1307-1333. ^ Andrea Cau; Federico Fanti (2011). "The oldest known metriorhynchid crocodylian from the Middle Jurassic of North-eastern Italy: Neptunidraco ammoniticus gen. et sp. nov". Gondwana Research. 19 (2): 550–565. doi:10.1016/j.gr.2010.07.007. ^ Mark T. Young; Mark A. Bell; Marco Brandalise de Andrade & Stephen L. Brusatte (2011). "Body size estimation and evolution in metriorhynchid crocodylomorphs: implications for species diversification and niche partitioning". Zoological Journal of the Linnean Society. 163 (4): 1199–1216. doi:10.1111/j.1096-3642.2011.00734.x. ^ Young, M. T.; Brusatte, S. L.; De Andrade, M. B.; Desojo, J. B.; Beatty, B. L.; Steel, L.; Fernández, M. S.; Sakamoto, M.; Ruiz-Omeñaca, J. I.; Schoch, R. R. (2012). Butler, Richard J, ed. "The Cranial Osteology and Feeding Ecology of the Metriorhynchid Crocodylomorph Genera Dakosaurus and Plesiosuchus from the Late Jurassic of Europe". PLoS ONE. 7 (9): e44985. doi:10.1371/journal.pone.0044985. PMC 3445579. PMID 23028723. ^ Massare JA. 1988. Swimming capabilities of Mesozoic marine reptiles; implications for method of predation. Paleobiology 14 (2):187-205. ^ Fernández M, Gasparini Z. 2000. Salt glands in a Tithonian metriorhynchid crocodyliform and their physiological significance. Lethaia 33: 269-276. ^ Gandola R, Buffetaut E, Monaghan N, Dyke G. 2006. Salt glands in the fossil crocodile Metriorhynchus. Journal of Vertebrate Paleontology 26 (4): 1009-1010. ^ Dietl G, Dietl O, Schweigert G, Hugger R. 2000. Der Nusplinger Plattenkalk (Weißer Jura zeta) - Grabungskampagne 1999. ^ Massare JA. 1987. Tooth morphology and prey preference of Mesozoic marine reptiles. Journal of Vertebrate Paleontology 7: 121-137. ^ Holliday CM, Witmer LM. Archosaur adductor chamber evolution: integration of musculoskeletal and topological criteria in jaw muscle homology. Journal of Morphology 268 (6): 457-484. ^ Martill DM, Taylor MA, Duff KL, Riding JB, Brown PR. 1994. The trophic structure of the biota of the Peterborough Member, Oxford Clay Formation (Jurassic), UK. Journal of the Geological Society, London 151: 173-194.